This year’s Brewery Trip is returning to London and three breweries with lovely teams. 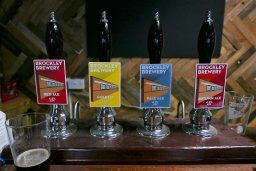 We will start at 11am with Brockley Brewery, just a short walk from the Brockley Station. It came into existence in May 2013, set up by seven friends including two sets of husbands and wives. Most of the owners are local and the brewery is proud of being based in the community, sponsoring a number of local charity events and the owners are not afraid to muck in. It’s a 5 barrel plant so the smallest brewery of the day. The standard range is Golden, Pale Ale, Red and a lager. These are complemented by four seasonal beers. We are likely to be met by Jon, the head brewer, who used to brew at Lovibonds. It’s then onto the train and up to Hackney Brewery based in a railway arch. They won the Champion Beer of London Award in March with their American Pale Ale. The team has grown substantially since setting up 2012 with a 6 barrel plant and just the founders, Jon and Pete, working from 4am to 10pm. Now, there are nine of them: the head brewer, Dan Walker, two other Brewers, two sales and two draymen. The kit is now three times as big with eight conical fermenters and they have moved into the premises next door. We will have a snack here before going to our third brewery, Five Points. 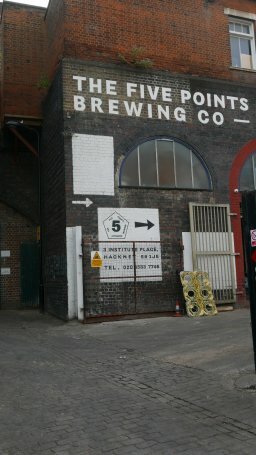 Five Points is one of those breweries that some people think have been around for a while but actually is less than six years old. 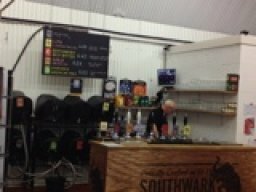 Financed by three shareholders, it was established in an old black cab garage; the brewery is another that is cuddled up in a railway arch. But space has not prevented the brewery's growth with continual investment in areas such as conditioning/fermenting tanks, bottling, canning and cold storage. The brewery's reputation has grown and, with it, the need for change. Five Points now operates over a split site with the brewery in Hackney and a bigger warehouse and distribution centre down the road in Mare Street. Five Points produce a combination of real ale, keg, cans and bottled and their Pale has twice won the Champion Golden Ale of London twice. Recently, the beer also won silver in CAMRA’s London & SE Champion Golden Ale judging so a great way to finish a lovely day of beer! This event is organized by cryneinyourbeer.